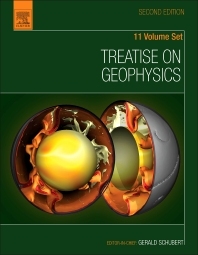 Treatise on Geophysics, Second Edition, is a comprehensive and in-depth study of the physics of the Earth beyond what any geophysics text has provided previously. Thoroughly revised and updated, it provides fundamental and state-of-the-art discussion of all aspects of geophysics. A highlight of the second edition is a new volume on Near Surface Geophysics that discusses the role of geophysics in the exploitation and conservation of natural resources and the assessment of degradation of natural systems by pollution. Additional features include new material in the Planets and Moon, Mantle Dynamics, Core Dynamics, Crustal and Lithosphere Dynamics, Evolution of the Earth, and Geodesy volumes. New material is also presented on the uses of Earth gravity measurements. This title is essential for professionals, researchers, professors, and advanced undergraduate and graduate students in the fields of Geophysics and Earth system science. Professionals, researchers, professors, and advanced undergraduate and graduate students working in the fields of geophysics, earth system science, geology, geomagnetism, ocean science, planetary and aerospace science, environmental science, seismology, petrology, mining and construction, urban planning, plus more. 4.07.1 Introduction: Why Drill to Study Earthquakes? 4.20.2 What Is Strong Ground Motion? 7.07.4 Where Does Basic Convection Theory Succeed in Explaining Plate Tectonics? 7.07.5 Where Does Basic Convection Theory Fail in Explaining Plate Tectonics? Gerald Schubert is Distinguished Professor Emeritus in the Department of Earth, Planetary and Space Sciences at the University of California, Los Angeles. His research interests encompass the physics of the interiors and atmospheres of the Earth, the Moon, and the other moons and planets of the solar system. He is co-author with Donald Turcotte of Geodynamics (ed. 3, Cambridge University Press, 2014) and with Turcotte and Peter Olson of Mantle Convection in the Earth and Planets (Cambridge University Press, 2001). He is the author of over 540 research papers. He has participated in a number of NASA’s planetary missions, including Apollo, Pioneer Venus, Magellan, and Galileo, and has been editor and editorial board member of many journals, including Icarus, Journal of Geophysical Research, Geophysical Research Letters, and Annual Reviews of Earth and Planetary Sciences. Professor Schubert is a Fellow of the American Geophysical Union and a recipient of the Union’s James B. MacElwane medal and the Harry H. Hess medal. He is a member of the National Academy of Sciences and the American Academy of Arts and Sciences.